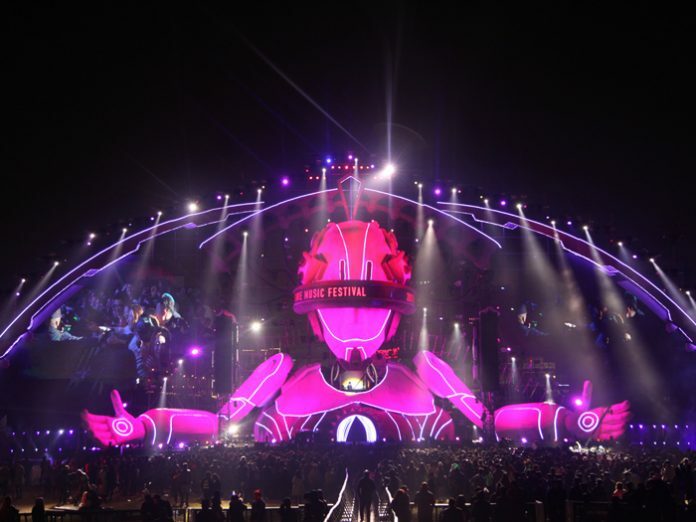 CHINA: The Mr. Future Music Festival brought nearly 40,000 fans to Wuhan, China to enjoy an array of hip-hop and electronic artists last November. Sharing the massive stage with acts like MC Hotdog, known as the ‘godfather’ of Chinese hip-hop, Dutch DJ R3hab, and Canadian EDM duo DVBBS, were over 100 Adamson loudspeakers supplied and supported by the company’s exclusive Chinese distributor, Real Music. Tickets for Mr. Future sold out almost immediately, meaning the stakes were high in delivering a memorable experience for the hyped-up crowd that filled the venue to capacity. The substantial system included main reinforcement from arrays of 15 Adamson E15 three-way, true line source enclosures per side. Because the unique stage design didn’t include hanging points, two speaker towers were custom-designed to suspend the arrays. Adamson’s compact S10 two-way, full range cabinets were deployed as both side fills, in arrays of 12 enclosures per side, and front fills, lining the lip of the stage. For low end, 16 Adamson E219 subwoofers per side were flown behind the main arrays with an additional 18 E219s and 12 T21s groundstacked for additional support. Founded in 2009, the Real Music Acoustic & Lighting Technology Co. has established offices in Beijing, Guangzhou, Shanghai and Xian City. The company is Adamson’s exclusive distributor for China, Hong Kong, and Macau and represents a large catalog of other pro audio, lighting, and music brands.